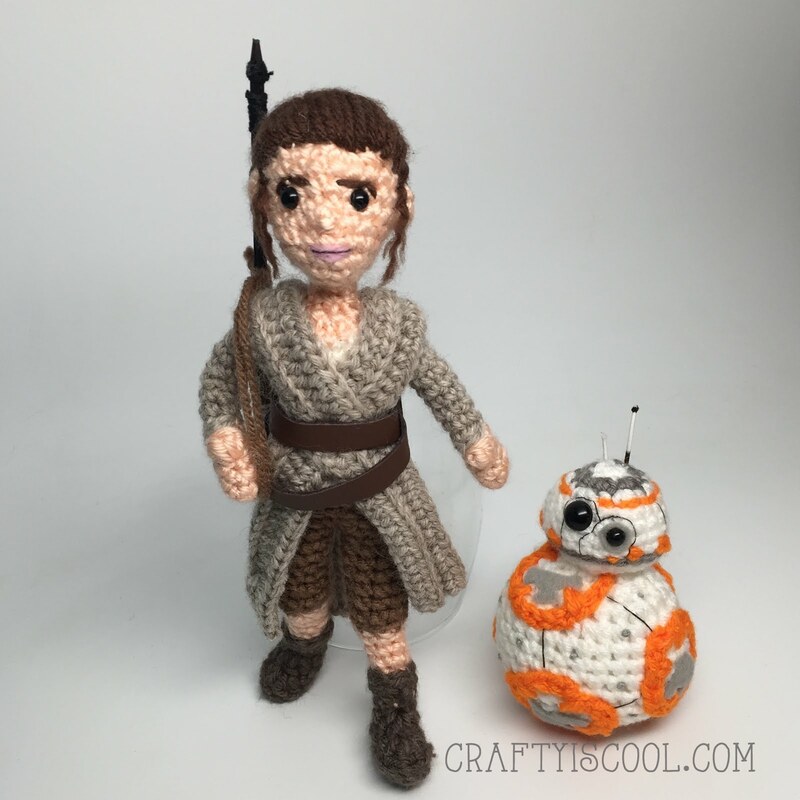 *** The pattern for Rey is now available! 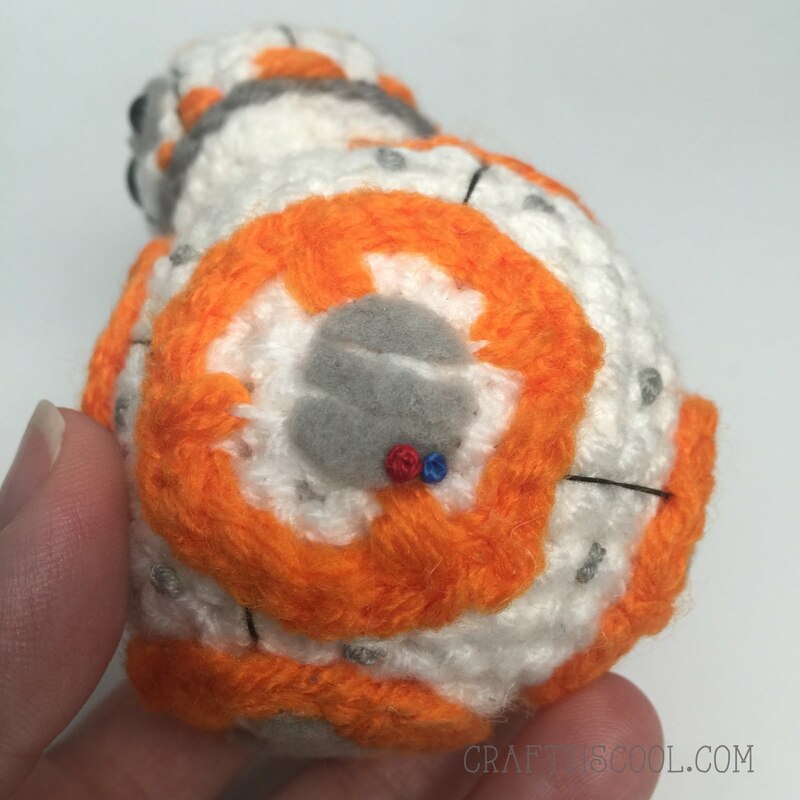 She comes with a PDF for BB-8 too! Available in my Etsy shop and on Ravelry! I'll tell you a secret. Until I had a nephew, I had never seen Star Wars. I knew the major characters, but nothing about the plot and never had an urge to watch. I grew up in a family of girls, so maybe that's why? I was more interested in Cabbage Patch Kids than Ewoks. I started watching the movies and now with three boys of my own, I've seen them all many many times. It was exciting to see the prequels in the theater, but nothing earth-shattering. I guess the letdown lots of people felt with those movies made the anticipation for the newest movie, "The Force Awakens", even greater. 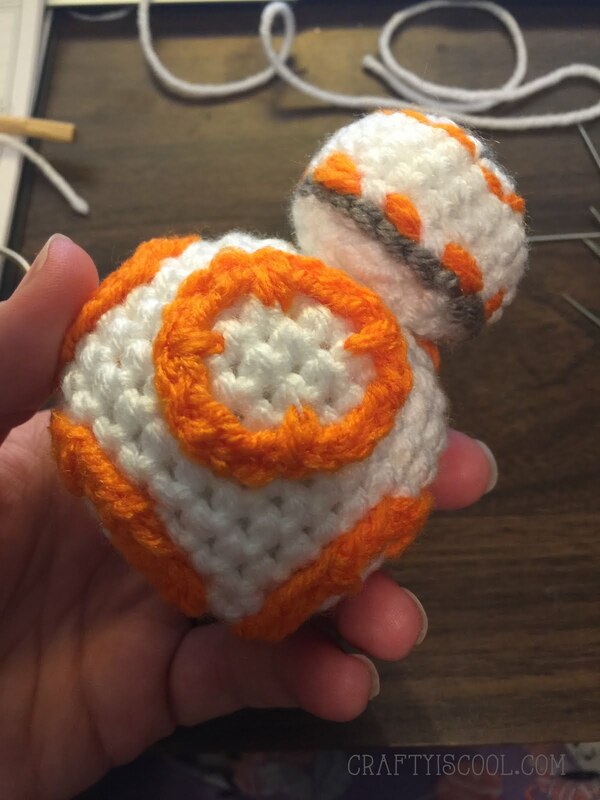 We knew the characters months before the movie was released, and BB-8 was super cute in the trailer. 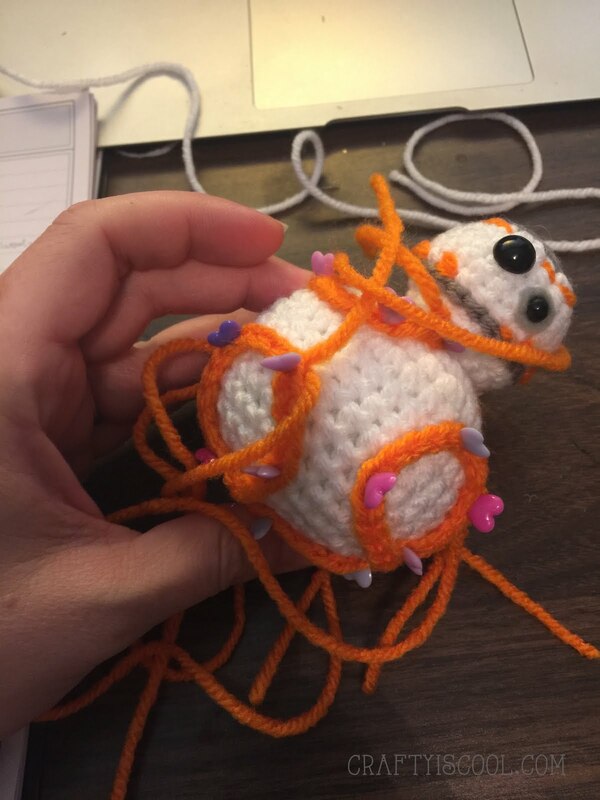 It was pretty much a no-brainer that I'd crochet him. To celebrate the dawning of a new year (welcome, 2016! 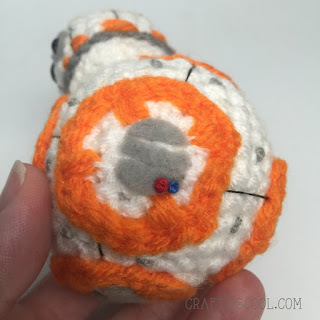 ), I've written a pattern for BB-8! He is now FREE for good! I had a lot of requests as soon as I took the pattern down and I had planned on putting it in my Etsy and Ravelry shops, but hey everyone likes free stuff, right? Rnds 6-11: Sc in each st around. Insert a stitch marker to hold your place. From the inside of the Body, insert the post of the doll joint through the beginning hole in Rnd 1. Stuff Body firmly. Continue adding stuffing as necessary as you work the final rounds. Fasten off and leave a long tail. Weave tail through the final round and pull to close the hole. Weave in ends. Change to yarn B (gray) at last st of Rnd 1. Change to yarn A (white) at last st of Rnd 2. Rnd 7: Sc in each st.
Change to yarn B (gray) at last st of Rnd 7. Rnd 8: Work a sl st into each st around. 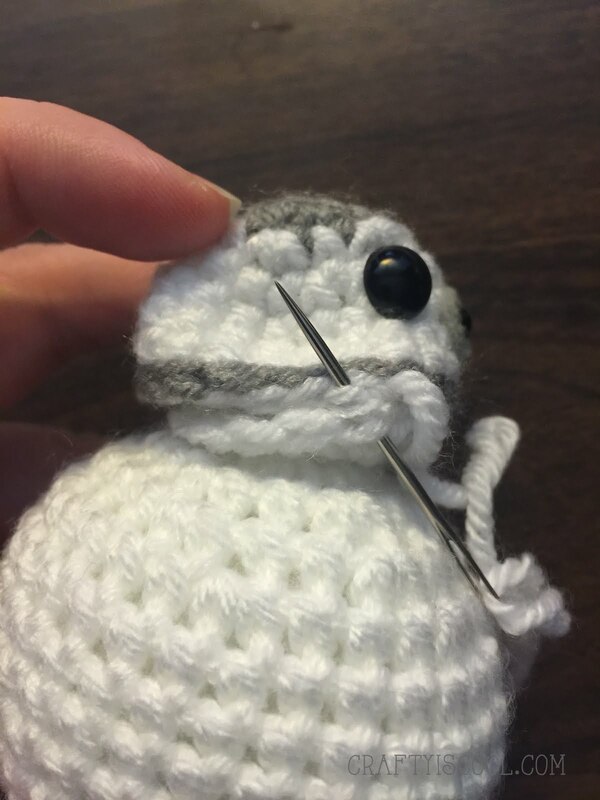 Keep the stitches relatively loose so they won't pull the last round tight. Fasten off and cut tail. Weave in white and gray ends. With gray felt, cut a 12 mm diameter circle. Cut a tiny slit in the center and insert the post of the 5mm eye. Insert the 12 mm eye between Rnds 4 and 5, and insert the 5mm/gray felt circle eye 2 sts away and one round down, between Rnds 5 and 6. Set Top of Head aside. Rnds 1-3: Repeat as for Top of Head, all in yarn A. Keep the beginning Rnd 1 loose to leave an opening in the center for the doll join post to fit through, as you did in the Body. Fasten off. Leave a long tail for sewing. Align Head Base over doll joint post sticking out of Rnd 1 of the Body. Push post through the hole all the way. Place flat washer over the post, then place locking washer over the flat washer. This should lock the doll joint mechanism into place. 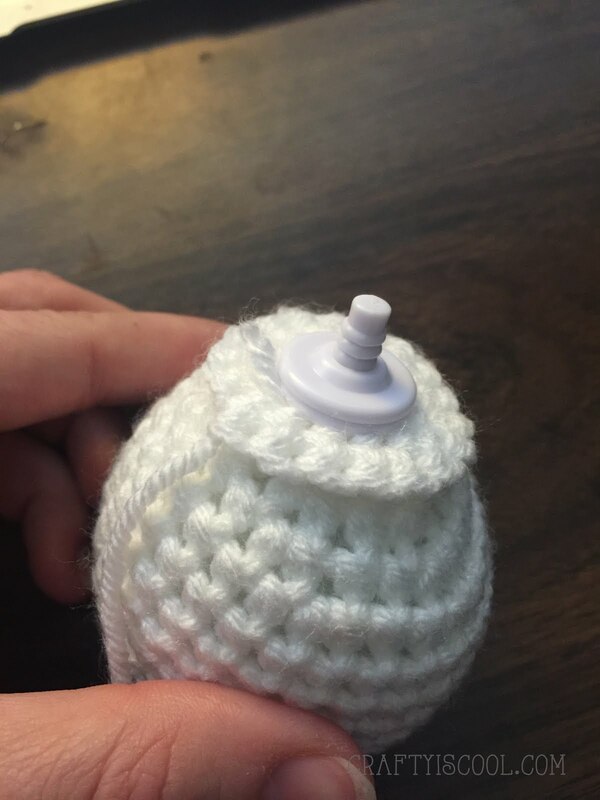 Sew Top of Head to Head Base with yarn tail and a yarn needle. Stuff as you sew up the last few stitches, making sure not to overstuff. You want the Head Base to be as flat as possible. Weave in ends. Make sure not to weave any ends through Head and Body or the Head will not turn. With yarn C, ch 20. Fasten off and leave a long tail. With gray felt, cut shapes to put into the centers of the Orange Rings. 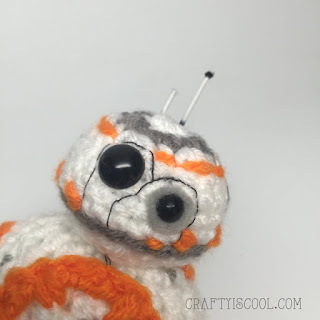 I cut them rather randomly (see below), but you can look at BB-8 photos if you want them exactly like him! For one of the rings, cut a gray circle, and cut it across in three segments. Glue gray pieces into place with craft glue (or super glue if you're careful! 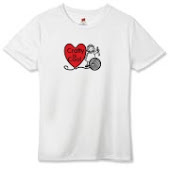 ), or stitch with matching thread. For the gray sliced circle panel, stitch a red French knot and a blue French knot with embroidery thread on the lower section of the circle. Refer to photo below. 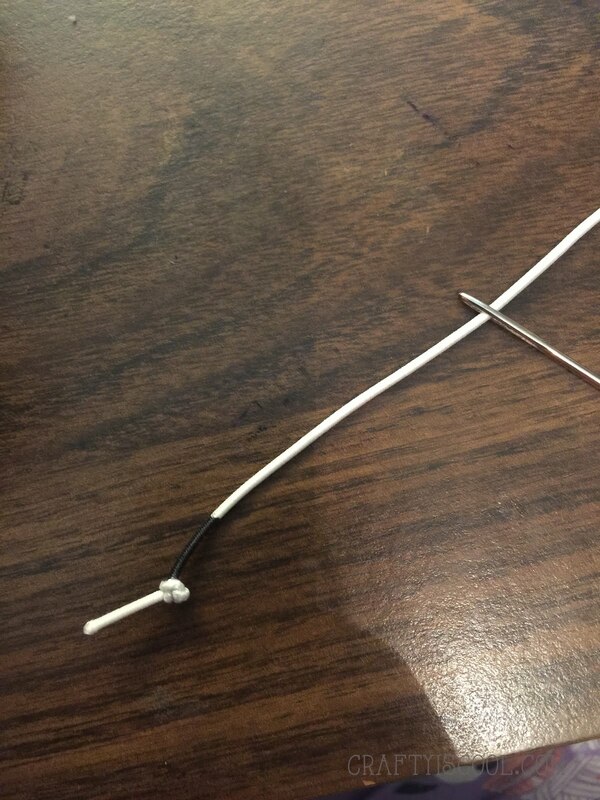 Thread an embroidery needle with one strand of black thread. Stitch long straight stitches between Orange Rings. Refer to photo above. Also with one strand of black thread, stitch an outline around BB-8's eyes as shown. Short stitches around the top will "curve" better than longer stitches. Stitch long straight stitches around the head from top to bottom as shown. 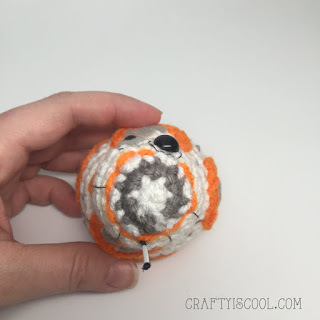 Thread a yarn needle with orange yarn C. Stitch short straight stitches around the base of BB8's head. 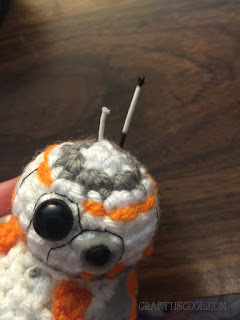 Stitch a continuous ring around the top of BB-8's head one round below the gray round. Weave in ends. With gray embroidery floss or thin yarn, embroider French knots on the Body next to each black line separating the panels, to resemble tiny screws. Weave in ends. Thread a yarn needle with elastic cord. Knot one end. Insert yarn needle into Head and pull up at the spot you want the first antenna. Cut the cord. Apply a tiny bit of craft or super glue to base and tip so it won't fray or pull through. For second antenna, knot a strand of cord and color with black marker near the knot. Pull through Head and up through the top and cut, making it a little longer. Color the tip black. Apply a little craft or super glue to base and tip to hold into place and prevent fraying. Your little BB-8 astromech droid is done! I think this project would be fun if you made him even smaller out of thread or sock-weight yarn, or even bigger with chunky yarn! The pattern will remain the same, but only the hook size needs to be changed. 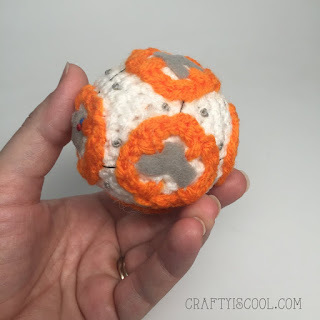 Please let me know if you have any questions about this pattern, or if you need any help. 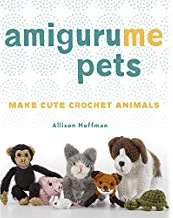 The toys you make from this pattern may be resold as long as credit is given as “Pattern by Allison Hoffman, craftyiscool.com”. Thanks! 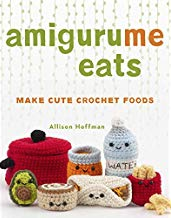 *If you would like to sell the items you make from this pattern or any of my patterns, please feel free, but on your listings make sure to include "Pattern by Allison Hoffman/craftyiscool.com" Thanks! 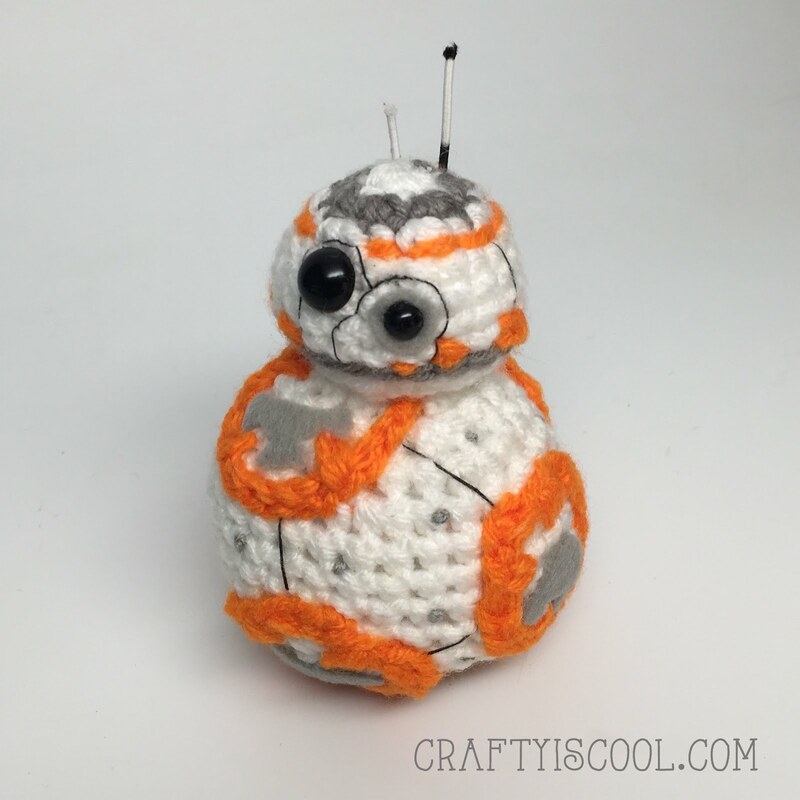 Watch for BB-8's friend Rey coming soon in my Etsy shop and Ravelry store! 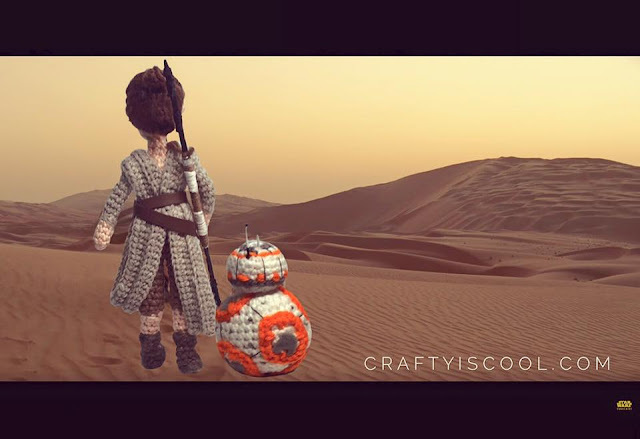 Allison, this is absolutely incredible, and I especially love the detail on BB-8! 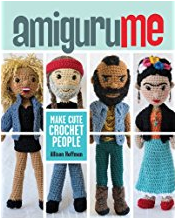 I just discovered your amigurumi, and I am really inspired by it. I like creating 3-4 inch characters, and everything you have shared on this site and YouTube is really helpful. Thank you! So glad you like it, Matthew! Thanks very much! You rock Allison. We took the boys to see it in 3D and I really really enjoyed it. Isn't it awesome?!! Loved it too! Oh how I'd love him I don't own any merchandise! I absolutely love this! Its amazing! I want to make the Rey too! Thank you so much! Rey will be available soon! He is super cute. Glad to see that the pattern is still for free. I was actually waiting for it to go on sale so I could have the PDF file. He is so cute ! Thank you for sharing your tutorial. Buy latest anarkali suits cotton, Our Anarkali suits collection is one of the best and highly loved by our customers. Find newest collection of anarkalis dress available in all size at aufashionkart.com. New Year Resolution for upcoming year 2017. To get all the information regarding Mat Aptitude Exam notification, online application, syllabus, admitcards, results,and counselling dates.